We offer five booklets. The first two are large ones. The rest are small one sheet trifold brochures for a quick introduction at a lite level. These are designed for printing by a print shop, a hundred or more at a time, on 11" x 17" paper. They can also be printed yourself on a color printer on 8.5" x 11" paper and bound using the ProClick system, which is what we use for small quantities. SPECIAL NOTE - The PDF files have two page spreads (such as pages 2 and 3, 4 and 5) that tell a wonderful story together. Download the files, open them with Adobe Acrobat, and then choose View, Page Display, Show Cover Page in Two Page View. Changing this setting will affect how PDFs appear in your browser. The versions offered online are for 8.5" x 11" paper. If you'd like to print some yourself on 11" x 17" paper, please contact us for the proper file. Here is the booklet PDF . This runs 16 pages and is a 9 MB file. CAUTION - This is a very large file because it's designed for high quality printing. This is THE place to start to evaluate the most important thing Thwink.org has to offer. We've worked very hard on summarizing our most powerful tool. It's a wrapper for Root Cause Analysis. The cover shows a prop we use during meetings to explain how Root Cause Analysis can work on difficult social problems like sustainability. The prop is small boards linked together with carabiners. The links form the causal chain present in all problems. The boards and links are used to explain how present solutions are working on the superficial layer. That's hopeless, because the force those solutions exert on intermediate cause cannot exceed the force exerted on intermediate causes by root causes. Grasp that point and you can see why this approach can generate a whole new class of solutions that have never been tried. This, we hope, will lead to the breakthrough so necessary to solve the sustainability problem. Here is the booklet PDF . This runs 12 pages and is an 18 MB file. CAUTION - This is a very large file because it's designed for high quality printing. 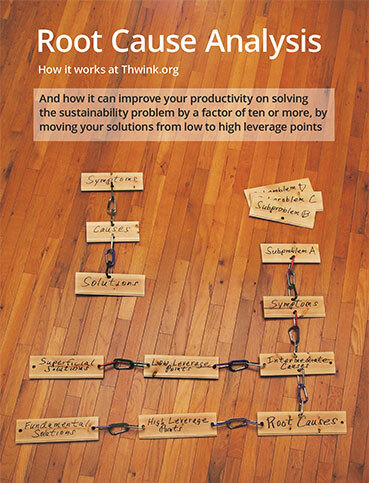 The Thwink analysis produced 12 sample solution elements. One of these is Common Property Rights (CPR). This is the only one of the 12 solutions that's ready for pilot testing. CPR can bridge the sustainability gap between where solutions are now and where they need to be because it resolves the root cause of WHY the world's economic system is improperly coupled to the environment. 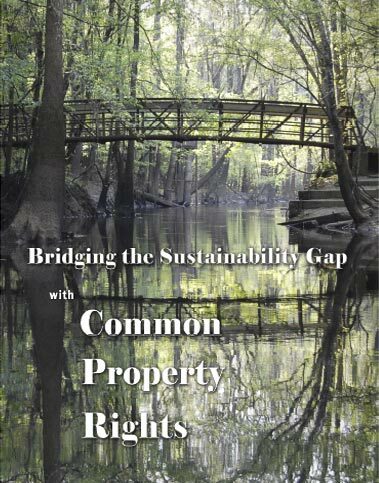 CPR is the mirror image of Private Property Rights. Like Private Property Rights, CPR is efficient, generic, and self-replicating. No other sustainability solution offers these qualities including regulations, pollution taxes, emissions trading, conservation, collective management, and privatization. conference in Columbus, Ohio, US. Click on one to read it. Photo taken on Columbia River, Oregon, US on July 28, 2012 during a fantastic cross country camping trip by Jack and Martha.